In a world where there are so many different kinds of humanoids, dragons are still the most mysterious. In fact, little Efina has no idea about herself and only knows that a man named Leo was there when she was born and that she has the power to make lies take a form, which then she happily devours. Being a dragon of such capabilities would be odd enough if it wasn't for the fact that the man she calls 'Papa', much to his annoyance, is a con-artist and tells lies as often as he breathes. And while she can't seem to make his lies manifest he uses her as a sort of lie detector, as they snoop around gathering up information to sell. 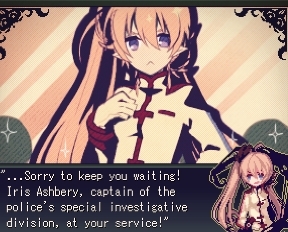 Alice mare creator Miwashiba's LiEat is a three part RPG adventure with touches of detective work here and there. With a unique cast for every story you'll find the people here are as colorful as the amazing artwork. Filled with original music, some challenging fights, and short, but brilliantly animated cut-scenes, LiEat is everything you could want from a story-heavy RPG and much more. LiEat is all about exploring, whether that's inspecting every item (with [enter] or [Z]) or speaking with everyone you can. It is only through doing this do you find healing items you'll need for the battles that are to come and keep the story progressing. Finding the healing items is very important as the only other way you're able to heal up is finding a bed and taking a 'rest'. But there are times where this isn't the most convenient or even possible. Occasionally, you'll need to speak to people in a certain order, but the character you're playing as, either Leo or Efi, usually gives you hints as to what to do next. Each of the three settings the story takes place in are small so even if you are stuck and missing something it doesn't take that long to search for what you accidentally skipped over. But even within the confined parts of this strange world there is still so much story waiting for you to uncover. Though in some cases if you're not careful you'll find an abrupt ending with no happily ever after, so you may want to save more often than you think. While Alice mare was a little rough around the edges LiEat is a quite polished gem of a game. Though you may have to grind a bit to ensure you can defeat the end boss of each chapter everything flows with the story and you can really get invested with the diverse cast. Efi herself is a truly charming innocent nine month old dragon who acts and looks more as if she is seven, and when you play as her you can't help but want to revert back to your innocence and run amok looking for entertainment, making friends, and just enjoying every bit of life you can. But while Efi is so optimistic and carefree there are some heavy elements to this game as some characters backgrounds come into light. At first even her caretaker Leo could be seen as abusive with his name calling and there are times where it seems as if he strikes her, though later it is explained that he is merely flicking her forehead. It's things like these that muddle his character and while at times he may seem endearing he ends up being one of the biggest enigmas of all. Efi is so entranced with him that you can't help but want to prove he is a better man than he pretends to be and it becomes very clear that the biggest mystery is going to be figuring him out. Three chapters that take about an hour each to play through will give you that chance and while short they weave a tale so beautiful you won't forget it or the characters for a long time to come. It looks exactly like the type of game I would be into. There is a free version, though, of all three LiEat's, translated by vgperson. I'm definitely going to check out vgperson and their website though.